Updated December 2018 – We still own and use the Breville Juice Fountain that we review below but it has been discontinued and replaced with the Breville 800JEXL. The new model is similar to the BJE510XL Juice Fountain in capacity and size but offers slightly more power, all stainless steel, a newly designed controls. 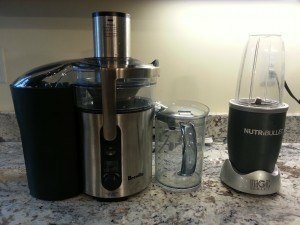 In this post we are going to review the Breville BJE510XL Juice Fountain Multi Speed Juicer because it is the juicer that we personally own and use. See picture to the right of our juicer next to a Nutribullet. If you are just starting to research juicers then you might feel a little overwhelmed. There is a wide range of prices, juicer types, brands, and attachments. We personally spent many hours comparing models and reading reviews before we chose our Juicer. As a little background, we were already using a Nutribullet single-serve blender everyday and became more interested in also doing Juicing after watching the popular documentary called “Sick, Fat, and Nearly dead” (You can watch if for free online if you haven’t seen it). In the movie, he uses a slightly lower grade Breville Juicer in the movie than the one we are reviewing in this post. We wrote about Juicing vs. Blending in another post so lets focus on Juicing in this post. First off, Breville BJE510XL juicer is a centrifugal juicer which means it extracts the juice from foods by spinning a blade at very high speeds. The main drawbacks that people claim with centrifugal juicers is that the motors can cause heat which can impact the juices enzymes and also that they can be less efficient extracting juice than cold press juicers(aka “Masticating Juicers”). (Actually it has been shown that juice enzymes are not impacted by type of juicer). Fortunately, centrifugal juicers have gotten more sophisticated with their blades, variable speeds and motors over recent years that they have become very efficient and remove many of these concerns that occurred with older juicers. The Breville juice fountain multi speed juicer scores very high on its extraction efficiency. It has a patented Nutri-Disc blade design along with an easy to use variable 5-speed control (You adjust the speed depending on what fruit/vegetable you are juicing). It also has been researched to only generate 1.8 degree in heat which does not impact the live food enzymes in the juice. This centrifugal juicer runs on a strong 900-watt motor with 5 speeds and comes with a built in smart-chip sensor. This sensor measures load quantity when adding foods so that it can adjust its power more efficiently. The 5 speeds are tailored for different food groups so that you get maximum juice yield from the machine. 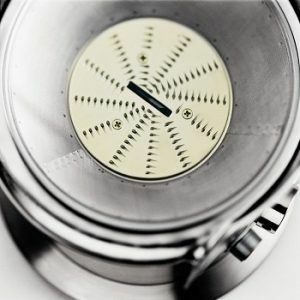 Another unique feature is that the juicer comes with an overload protection technology so that it automatically shuts down the juicer if it has been running too long, gets hot, or feels that something isn’t right. We listed this feature first because lets be honest, the biggest complaint about juicing is having to clean the machine. Some machines are pain in the you know what to clean up. Ease of use and clean up is a HUGE design feature for Breville. They have an ingenious design that allows for very fast clean up. We have tried some juicers that require a lot of food preparation before being able to use them. What makes the Breville juicer unique is that it has a 3-inch wide chute allowing ample space for feeding whole vegetables and fruits. This juicer is well built with metal parts and patented Nutri-Disc titanium blades. We were impressed by the strength of the mesh filter. The filter can effect the efficiency of how well you extract the juices. We already mentioned the overload protection technology that this juicer has, but it also has a terrific locking feature design that locks down the top of the juicer before being able use it. Some juicers make a loud screaming sound but the Breville is very easy on the ears and quieter than a typical juicer or blender. In fact, many reviewers state that this Breville is the quietest power juicer on the market? Disadvantages of this Juicer ? The main disadvantage of Centrifugal juicers is being able to extract juice from leafy vegetables (spinach / Kale) and herbs but this juicer does OK with that. Other than that, we honestly don’t have any (Which is why we bought this juicer model ourselves). A trick to increase juice yield on leafy greens to stuff it in between two hard ingredients like apples and cucumbers when feeding it in the chute. This juicer is very solid but is larger than some juicers measuring about 15.5″ wide by 16.75″ tall. The benefit is that you can make a large amount of juice quickly and store it in the refrigerator. For the price it is very reasonable compared to other centrifugal juicers. We prefer the design and unique features that this model had over other brands and other Breville juicer models. The Breville BJE510XL Juice Fountain Multi Speed Juicer has exceeded our expectations. We found that it is very efficient in extracting juice and we love the ease of use. The variable motor is great. The design and easy to clean is the biggest selling point for us. Overall for the features, quality and price we feel you can’t go wrong with the Breville BJE510XL Juicer Fountain. P.S. 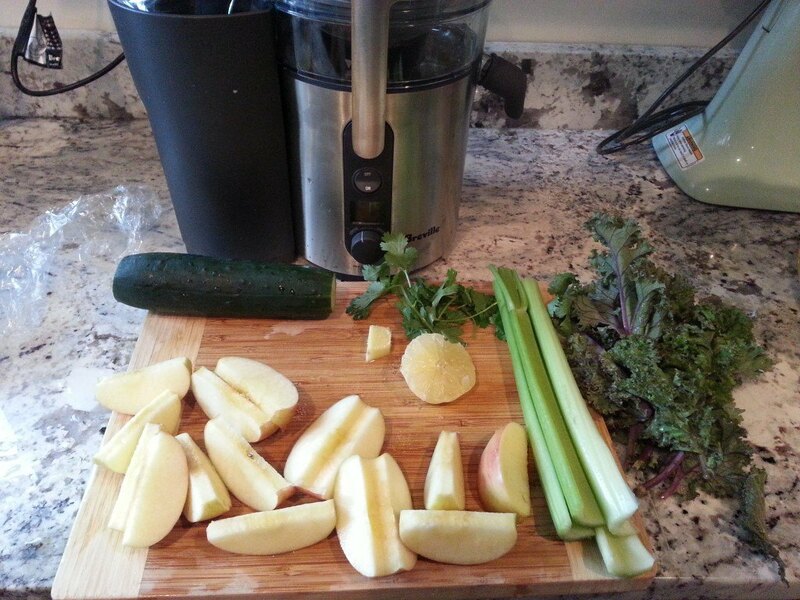 – Below is a picture of the ingredients used to make the “Mean Green Juice” recipe. This drink is what was used in the movie “Sick Fat and Nearly Dead” where Joe lost 82 pounds in 60 days drinking this drink. This makes about 20 ounces of Juice.